You should be watering basil plants every week or so, depending on the amount of rainfall in your area. This will help your basil plants reach their maximum size and produce the most leaves. It's a good idea to fertilize basil plants every 4-6 weeks. Basil plants do best when the soil is moist. When irrigating basil plants, focus your efforts at the base of the plants. Mildew and fungus tend to grow on wet leaves and foliage. If you don't water the tops of the plants, the less likely that your basil will be affected by diseases. It's a good idea to water in the early morning hours. This way, the afternoon sun will evaporate any unused water. If it rains in your area, you may not need to water your basil plants at all. Using your fingers, dig down into the soil next to the plants, being careful not to disturb the roots. If the soil is moist 2 inches down, you're in good shape. If the soil at this depth is dry, it's probably time to water. A slow, deep soaking method of watering basil plants is best. Avoid using high pressure sprayers or hoses as this may cause erosion of the soil around the plant. A watering can or very slow running garden hose or soaker hose all work well. The idea is to keep the soil moist but not waterlogged. Basil plants will wilt and die if they sit in soggy soil for too long. 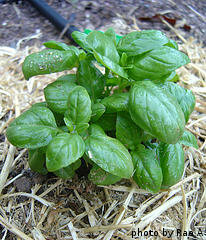 A layer of mulch can be applied around your basil plants. This helps keep the moisture in the soil and also prevents weeds. Grass clippings, straw or chopped up leaves work well as mulch. Basil plants will do well with a small dose of fertilizer every 4-6 weeks. You can use a water-soluble type fertilizer or a granular product. If you choose a water-soluble type, mix it with water according to the manufacturer's directions. Apply it when you would normally water the plant. If you choose a granular type fertilizer, choose a balanced one with equal amounts of nitrogen, potassium and phosphate. 10-10-10 or 12-12-12 formulas work well for fertilizing basil. Scatter the granules around the plant and water them in well. Try not to let the granules come in contact with the plant as this may cause it to burn. Most granular fertilizers are applied at a rate of 1 1/2 pounds per 100 square feet. If growing basil in containers, scatter a small handful of granules on top of the soil around the plant. 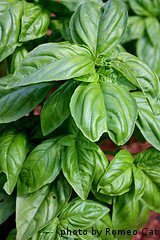 If you continue fertilizing and watering basil on a regular basis throughout the growing season, your plants will have an excellent chance of producing more than enough of fresh basil for you and your family. Once the basil plants get big enough, it's time to harvest those succulent leaves.